On the third day of the Great Works (February 11), a group of about 30 VIPs, including Mr. Kwassi Klutse (the former prime minister of Togo) Mr. Iakoba Taeiz Italeli (the head of state of Tuvalu), and Blaz Lanzoni Achinelli (a senator from Paraguay), participated in a VIP Holy Ground Pilgrimage. 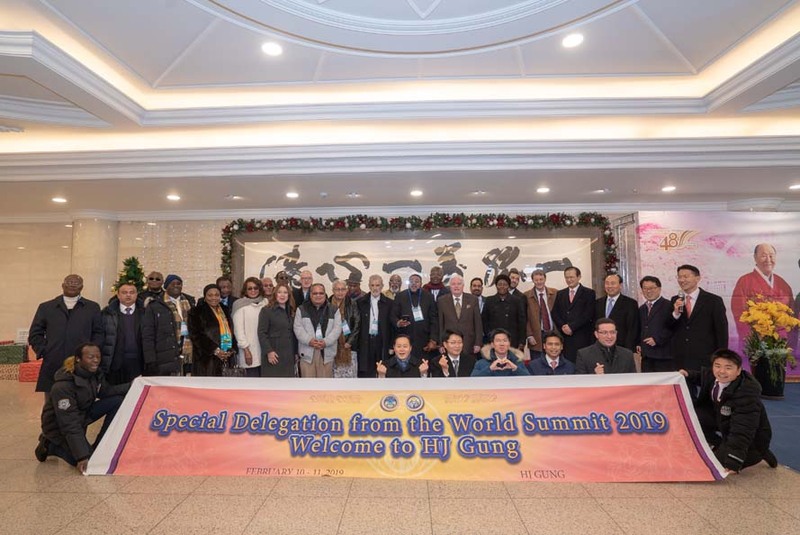 They were also participants in the “2019 World Summit” which was held on February 8. President Gi-seong Lee and Vice President Myong-kwan Lee, as well as the four branch training center presidents, along with training center staff, gave the VIPs a warm welcome in front of the Tree of Love. First, the VIPs were given an overview of the various buildings in the training center. Then they moved to the first floor lobby of the Cheonseong Wanglim Palace, where they heard an explanation of the message expressed in True Parents’ calligraphic motto, “Cheongshim-Il Manseung-Il” (when you come to unite with HJ Heaven and Earth CheonBo Training Center, all your endeavors will succeed) and took commemorative photos in front of it. Then they moved to the fourth floor of the HJ CheonBo Waterfront Café and erupted into cheers at the view of Cheonshim Lake stretching out before their eyes. A video program and promotional brochures gave them a look at the history of the HJ Heaven and Earth CheonBo Training Center. President Gi-seong Lee explained that True Parents have taught us, “If you pray at the HJ Heaven and Earth CheonBo Training Center, you can communicate directly with our Heavenly Parent.” He emphasized that many workshop participants have been spiritually reborn through the chanyang and that the training center is a miraculous place where people can liberate all their ancestors who are their spiritual roots. Next There is nothing on the board.